FurGravity Ventilator and Skylight Combination shall be Model No. _________ as manufactured by Dur-Red Products. They shall be factory fabricated units consisting of a fixed louver blade. The blade, base, and corner post, shall have a 20 gauge G.I. 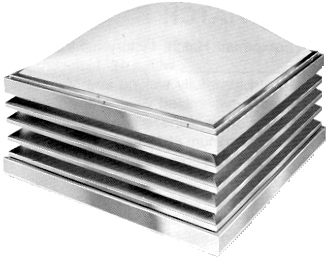 louver blade that is continuous. The gravity ventilator shall consist of a one-piece acrylic dome; white translucent or clear colorless acrylic. Dome frame shall be an extruded aluminum 6063-T5. Frame minimum thickness of .070 and provide a self-contained sloping condensation and weepage gutter for drainage.